I am just not in the habit of updating it. It's kind of interesting, actually. It took a month of writing updates to get me in the habit of writing in this thing, but then maybe a week, two weeks tops, before I fell out of the habit of updating every day. After that, it seemed inevitable that whole months would go by before I said anything further. Since I last wrote, I've had some firsthand experience at using some of the techniques I've been theorizing about since reading the DMG 2 and musing on it. I have learned a great deal from them. After class, I'll update on the first few of these, and talk about what I have found works, and what seems like I could do a bit more tweaking. Okay three, two, one, let's jam. So I've been thinking a little more about how to bring about an epic feel to combats in D&D. Most of what I've come up with so far is from when I ran an Exalted game. It was incredibly fun, and managed to have some phenomenal moments. It was certainly something that helped me grow as a GM, and I'm hoping to put some of the lessons I learned from it to good use. 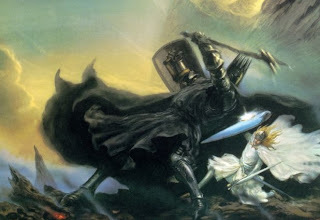 For now, while I'm not sure how to make an appropriately iconic fight in D&D (it may well be that the mechanics and style of fights I'm talking about aren't what D&D is about) I can work towards the goal of making the entire game feel epic. Or rather, like an epic. I've been learning a little about sagas of late, and well, let me just say they are pretty cool. I think I can translate the feel and focus on character. So far, that's kind of been how sessions have played out, the characters have started building relationships with each other, and also with some of the NPCs in the little village. It's similar to the philosophy behind Bruce Lee's fighting, the whole intercepting fist thing. My monk will be all about ending the fight as soon as it starts. So if someone starts something, I go, and then unleash a devastating attack. Afterward I'll be entertained in the fight, because the powers I have are entertaining to me, so there's another plus. So far, what I've come up with is that my guy's fighting style is all about finding the flow of breath/spirit which ties all living things together, and either balancing/centering it (in the case of stuff I do) or disrupting someone's energy (when I stabinate them with my fists). Top that off by being Githzerai and having crazy Mental Discipline, and I'm all set for fun. Oh and he's named Zuo. Then you must go beyond the impossible and kick reason to the curb. 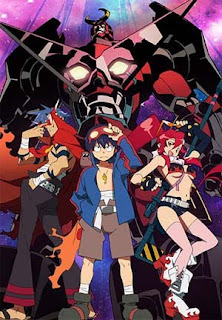 That's the team Gurren way. Holy cow. That looks totally awesome! I want you to try something. Take a minute and picture in your mind the most epic battles you can think of. Go on. Close your eyes and see it unfolding upon the canvas of your imagination. "A day of wolves and shattered shields"
It boils down to one thing. Not size, nor scale, nor spectacle, but it comes down to the ideas driving each of the fight. When all else is said and done, and every other option has been taken, it all boils down to two people duking it out for the fate of their ideals. With Luke and Vader, it's both sides of the Force warring for redemption or corruption. 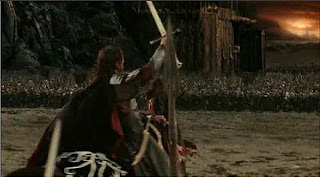 With Aragorn, it's his fight to prove the strength of Men and reclaim his throne. 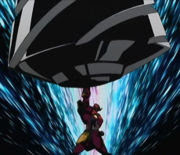 With Simon, it is a fight for his humanity and drive to pierce the heavens. That's what helps a fight transcend "just another fight" and become something memorable, something personal that reaches in and grabs you by the heart making you jump up and shout YEAH when the good guys win, or sit at the edge of your seat when you're not sure what will happen. It's what grabs us. Now the only way for something like this to have that much meaning is for it to be the end of a larger struggle. 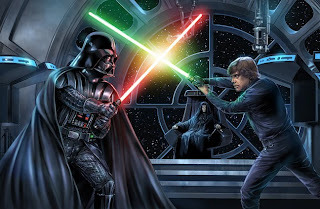 It wouldn't be as cool if Luke and Vader fought one another without the context of the rebel alliance and the empire, or if the Dai Gurren Brigade just stomped all over some tough enemies without having come as far as they did. These fights signify the end of a journey and the start of a new one. This transcends medium as well, because it works just as well in books, movies, or if it's done well, video games (if you've never seen the end of Okami, go play it now, beat it, and oh man). What I wonder is... how well would this work for D&D? How to pull it off? Let us talk about failure. Man, I sure slept alot. But I digress. Back to failure. What I aim to do in this post is to take a look at how when the PCs fail in your campaign, it's something that can not only drive the game forward, but it can make for more memorable moments in your game. Knowing that they can suffer consequences for failure, but that it won't shut down what they can do, helps to establish the game world as more real for the players. The PCs encounter a mystic riddle which they must solve in order to get through to the next room where the guardian of the Staff of Doom awaits to give them their final test. Now say you've come up with a cunning riddle or puzzle and the players just don't have a clue... say you even made it a skill check (or challenge) and that the PCs just don't seem to have the proper skills. So they stare frustratingly at the wall, and get more and more agitated as you keep prompting them to try again. That's boring, agonizing, and nobody likes trying the same thing over and over again (I'll talk about how this applies to skill challenges later.) So what can you do? It's all about the consequences. Sure, they may not be able to puzzle their way through the mystic ward, but even if they can't do that, they've got to get through to the next room. So instead of making the consequence of failure "you don't get past" why not have it be something else, like, "monsters attack" or "you take a penalty to certain skill checks with the guardian." This makes it less about whether or not the characters succeed, but more about how much it costs them to do so. This is where the majority of the tension stems from when we're engaged in any other kind of story. We know the hero of the book (probably) won't die, and that she'll ultimately succeed, right? But what keeps us turning the page is finding out how she will use her skills and abilities to ultimately triumph and what it will cost her to do so. Let's take another example: The PCs are negotiating a peace accord, so that they can fight a greater foe. Now, here if they fail, one consequence could be "peace isn't achieved" which means that the battle with the greater foe can still happen, it's just harder as the PCs don't have the allies they need. Another thing you could do, however, is increase the cost of peace. Perhaps the PCs must end the negotiation in favor of one of the opposing sides, when they'd really just want a balanced or even oppositely weighted decision. Or suppose they are trying to pick the lock on a door, but fail... they can still get through the door, but they might open it just as guards are coming around the corner. This option works in combat as well. Suppose the PCs are out to try and stop an evil horde of goblins, and in an encounter with some particularly powerful goblin casters, they end up having to retreat. You can have the goblins become a little more empowered, making for slightly harder fights in the next few encounters, or even create an "against the horde" encounter as they rally behind their mighty warcasters. The possibilities are limitless, but remember... ultimately, what keeps us going in these things is to find out how the heroes win. More specifically, dungeon-building. I'm going to be putting together one, you see, and so I've been compiling lists of encounters and how they all flow together and so on. As you know, I've been talking about how I would encourage explorers in a game, which, even if my players aren't Explorers by nature, I'd still like to do because it gives them the opportunity to be rewarded by investigating the world they live in; and rewards are something that appeal to all player types. For the power gamer or slayer it is a chance to use new and different powers to defeat their foes (through terrain powers which I'll talk about shortly), storytellers and actors might find their characters feel a little easier to inhabit when the world comes to life for them, and they can see how directly it can be affected. Thinkers and Explorers are both rewarded by the fact that there's new stuff to incorporate into their plans, and a mechanics-based incentive to not spend every action making an attack. Watchers get the opportunity to try something new, which can be exciting. So anyway, with that in mind, I've been looking at how I would encourage players to go beyond their lists of powers in fights. My friend Frank, who is an awesome guy, suggested that I design fights where mastering the terrain becomes more important than defeating the monsters. Essentially, I'd be making the terrain as great a threat as the monsters. I think this is a fantastic idea, and I've been putting together an encounter with that in mind. I've also been thinking about giving players more options which are revealed through exploration. This is where using the player's passive perception/insight scores comes in handy, because I can give them a subtle hint that something bears further investigation. On top of that, it makes them feel like their skill choices were worthwhile, which I'm always down with. An evil cult has inscribed a mystic circle on the floor, at the center of which is an iron brazier filled with smoldering (smouldering if you are British or a jerk) coals. Around the brazier, the evil cultists chant, using their fell magics to empower some dark ritual with fell and dark and dark and fell energies, that are also dark, but strangely, not fell. So a hero, fed up with how many fells, but not darks strangely enough, the cult just used, shows up and rather than rushing at the cultists with his sword, rushes at the brazier and pushes it onto the cultists. So now I would describe the coals and flame spilling out onto the cultists, and the chaos that ensues, and to back me up, I can give the brazier a terrain power. I can say that the player makes an attack at something like, his level + 3 vs. Reflex in a close blast 3. Targets hit take 1d6 + Level Fire Damage and are knocked prone, with half damage on a miss. Then, depending on how tough the fight has been for the PCs I can give them another boost here by having the spilled coals act as difficult terrain that causes 5 points per tier of fire damage if you move through more than one square in the zone on your turn. This lets me help the party out in a tough spot without being obvious, and the opposite is true as well. By having monsters employ terrain powers, I can make a fight tougher if it looks like the players have it too easy. Terrain powers are useful tools that help you both spice up an encounter, and allow you a greater degree of behind the scenes control. And for my style of running games, I like to keep my meddling with the plot and the way the action goes as behind the scenes as I can, so I think these are fantastic. The trick here is in revealing these to your players without coming flat out and saying, if you do this, X happens. So instead considering describing that the brazier looks unsteady, or have a PC with a high perception notice that the brazier doesn't seem to be anchored, or even something unusual about it, warranting an active perception check. So I am going to try and put these to use as best as I can in the coming days. I really really want to play D&D some more. I've been toying around with the idea of implementing quests a little better in D&D. At least than I would have before. Earlier, what I've done is treat them much like quests in a video game function: give the players something to do, with maybe a sub-goal or two and then they complete it for some "Story XP." This is fine, but my aim is to make D&D more engaging and dynamic when I'm running. My hope is that this will keep people interested in playing consistently, and getting more involved in the game. So I've been thinking about how I can make quests a little more dynamic. Here's what I've come up with, along with some advice from the DMG2. The first thing is to make quests seem more personal for the characters. The DMG2 says this is an excellent opportunity to build and develop character personality. Give the PCs something personal to try and accomplish and it helps them decide what adventures to take and what decisions to make. This in turn shapes the character on a much subtler level than, say, charging in to attack every time they see an orc (which is another GREAT way of adding character depth by the way). Plus if the quests hold personal interest for the characters, it, once again, engages them on a deeper level. And then of course you can play with the ideas/goals of the quest, either pushing the party to cooperation or conflict depending, which adds a wonderful dynamic to the party's roleplaying, and helps keep both group and individuals distinct. So let's say, for example, that I've got an adventure that takes place in a forgotten citadel, where the PCs are going to try and stop some cultists of Orcus from carrying out their diabolical plan. I can use quests to give the characters in the party differing goals that they'll try to fulfill within the dungeon itself. So where the druid might want to travel to the dungeon to try and undo some dark ritual that the Orcus cultists have conducted to drain power from the land, the fighter might be motivated to retrieve the sword of a legendary warrior, said to be entombed within the walls of the imposing fortress. And while this is happening, the rogue's nemesis' trail leads to the citadel. Already this gives the party three different goals to pursue there, and it prompts further roleplaying/involvement in the adventure. There's the dynamic of the party trying to decide which goals to pursue first, which promotes some intraparty roleplay, and then there's the added focus on each character as they near the climactic encounter of their personal quests (maybe the Fighter has to deal with the Spirit of the Warrior somehow, or while fighting off cultists, the druid has to counteract the ritual) which opens up new options for the group besides simply combat. It's even better if this happens during a fight when player energy levels are already high, or works to punch up a lower energy transitional moment within the game. And this means that I can hand out rewards a little more personally, and be a little more forthcoming in encouraging the players to be proactive about having their characters come up with their own quests. The DMGs say that D&D is a cooperative storytelling game, and the latest one encourages players to be more involved in the narrative process. I'm inclined to agree, and I hope that this will make for a more engaging game all around. I'm a geek. I'm also an actor, a student, and apparently a blogger now. I have l33t skillz.